Classroom Freebies Too: Ways to Save Grading Time! Ways to Save Grading Time! Do you feel like you spend all your nights and weekends grading? If so, I have been there. I have a little tip that worked has worked for me in the past. I also asked the same question over at the Facebook Fan Page, and the fans gave plenty of suggestions as well! Make sure to grab your freebie eBook to get all the ideas in one place. 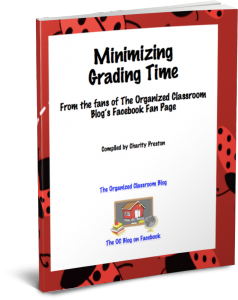 Want your copy of the Minimizing Grading Time eBook?